Engineering is a line of work where mistakes can be costly on many levels. 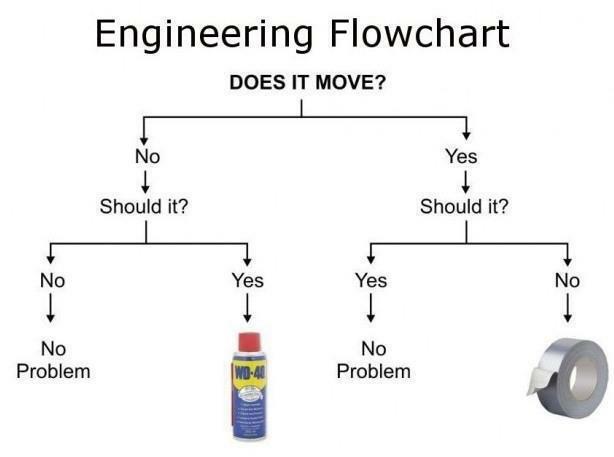 You would think engineers are a serious bunch of people, but there are an awful lot of engineer jokes out there. Here is a list of some of my favorite engineer jokes. Feel free to share yours in the comments if you have a good one. Definition of an engineer: Someone who solves a problem you didn’t know you had, in a way you don’t understand. Engineering is all about laziness in the name of better life. Arguing with an engineer is a lot like wrestling in the mud with a pig. After a few hours, you realize that he enjoys it. Q: Why do computer engineers get Halloween and Christmas mixed up? A: Because 31OCT = 25DEC. and cuts it with an axe. Q: What is the difference between Mechanical Engineers, Civil Engineers and Chemical Engineers? A: Mechanical Engineers build weapons; Civil Engineers build targets. Chemical Engineers are engineers that build targets that explode really well. Q: What’s the difference between a chemical engineer and a chemist? A: A chemical engineer does for profit what a chemist does for fun. A programmer and an engineer were sitting next to each other on an airplane. The programmer leans over to the engineer and asks if he wants to play a fun game. The engineer just wants to be left alone, so he politely declines, turns away, and tries to sleep. The programmer continues to pester the engineer. “C’mon, it’s a real easy game. I ask a question and if you don’t know the answer you pay me $5. Then you ask me a question and if I don’t know the answer I’ll pay you $5.” Again, the engineer declines and tries to sleep. The engineer doesn’t say a word and just hands the programmer $5. The engineer asks the programmer, “What goes up a hill with three legs and comes down on four?” The programmer looks thoughtful, takes out his laptop and starts to surf the net for the answer. After an hour he wakes the engineer to hand him $50. The engineer takes the money, turns away, and tries to go back to sleep. Without a word, the engineer reaches into his wallet, hands $5 to the programmer. A group of physicists and a group of engineers were travelling by train. Each physicist had their own train ticket while the engineer group had only ONE ticket for all of them. The physicists started laughing, figuring the engineers were going to get caught and thrown off the train. One engineer spots the conductor coming and they all duck into the bathroom. The physicists were puzzled. The conductor came aboard, said, “Tickets, please,” and got tickets from all the physicists. He then went to the bathroom and knocked on the door and said, “Ticket, please.” The engineers stuck the ticket under the door. The conductor took it and moved on. A few minutes later, the engineers came out of the bathroom. The physicists felt really stupid. On the return trip, the physicists decide they should try the engineer’s scam. They bought one ticket for the whole group. They met up with the engineers in the same car. The physicists all smile and wave their lone ticket. This time, the engineers have no ticket. One engineer nods towards the door between cars and says, “Conductor coming!”. The engineers sat back as all the physicists locked themselves into the bathroom.